The geological formations here formed over 100 million years ago. The outcrops of rock are called Monadnocks. 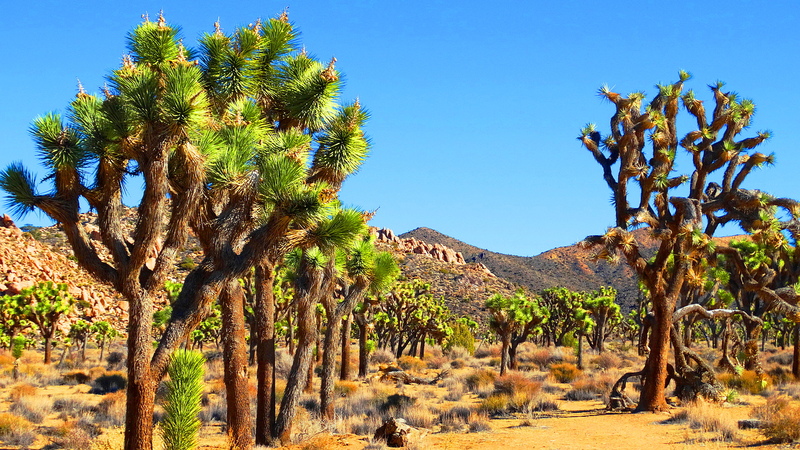 Joshua Trees are native to the south-western United States and live mainly in the Mojave Desert where the National Park is located. 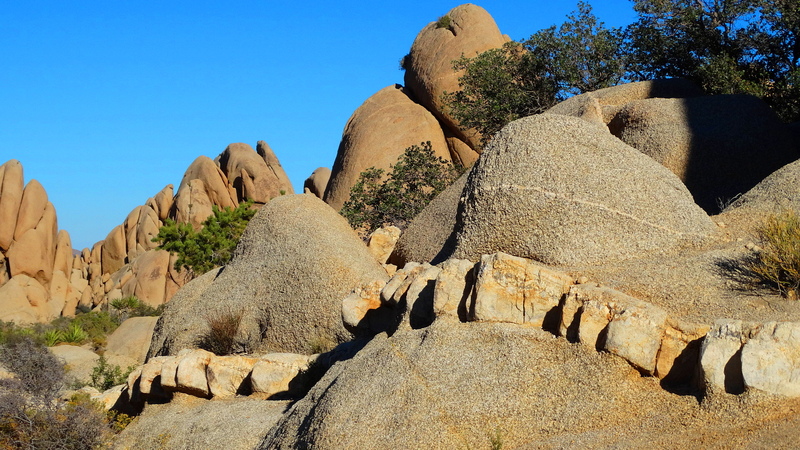 The geological formations in the park are some of the most interesting in California. I have lived within a three hours drive of this place all my life and have never been here. Obviously, having gotten my first look today, I can not imagine why I never came here before! It is gorgeous!! 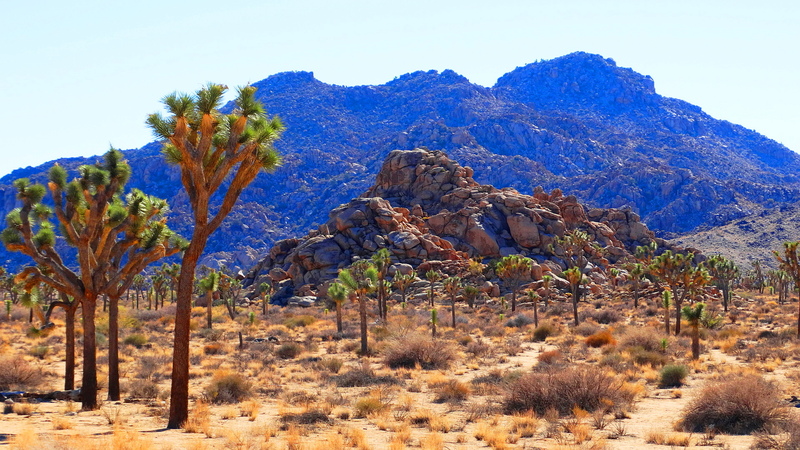 Joshua Trees scientific name is Yucca Brevifolia and it is a member of the Yucca family. They are blooming now and I’ll show you this beautiful sight soon. There are lots of plants here I have never seen before and I will show them to you soon too! I named this formation the dinosaurs spine because this is just what it looks like to me! Cheers & more to you soon from this amazing place! I am jazzed to be here! Isn’t it wonderful what we still have to discover, almost on our own doorsteps. Look at the blue of your sky! Yes! One can never see everything and I guess that keeps us all young! Ah, so that is why I am shrinking…I am getting younger. 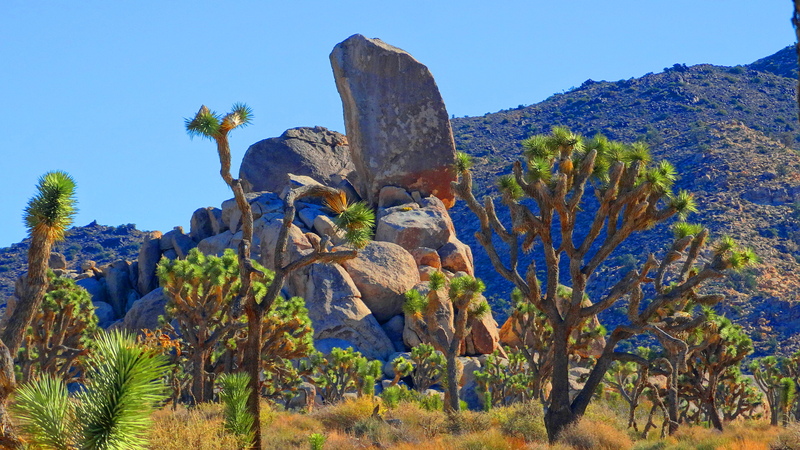 I have ALWAYS absolutely loved Joshua trees! Stunning photography! So happy you do & cheers to you! First you have to make sure it can live where you are !! Otherwise, I would expect one under your tree!!!! a unique landscape, stunning, so glad you are excited Cindy! To discover something this wonderful, that I always just drove by in the past is surprising and wonderful! Cheers to you! how wonderful that we still keep learning Cindy! Only a link appeared in my reader, no photos. These are beautiful. At least that posted! And thank you!!! Awesome pictures, a place to go! It is quite wonderful, especially overnight! Quite a alien landscape, but so beautiful! Wow! You are in my favorite place of all times! Thank you Cindy.They are beautiful trees. Thank you Ranu, it’s a remarkable place! Wow wow wow! Gorgeous pics, amazing place. I wanna go there! Those rock formations look almost man made in some of the pictures. 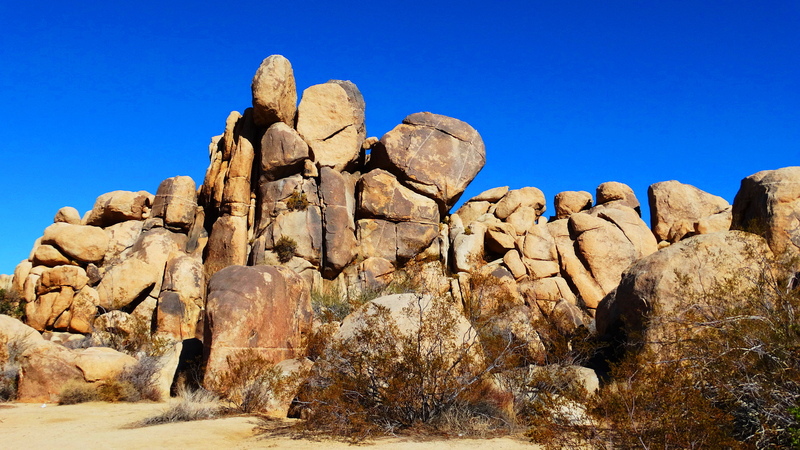 They look like someone piled up the rocks or lined them up in a neat line. 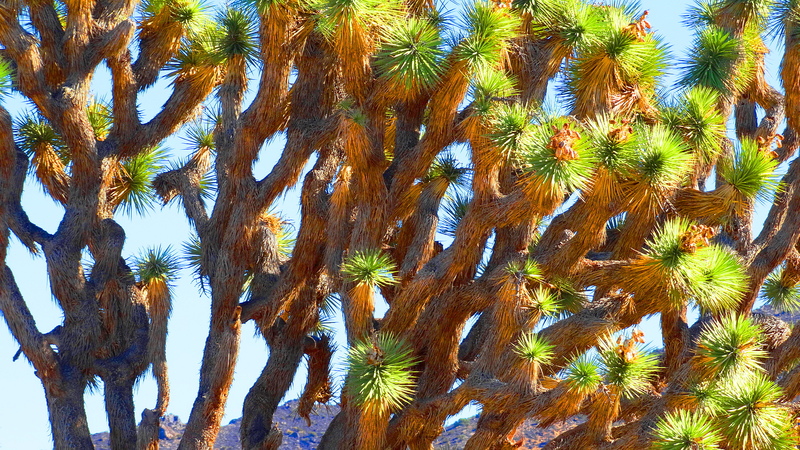 Is the Joshua tree pinchy ? 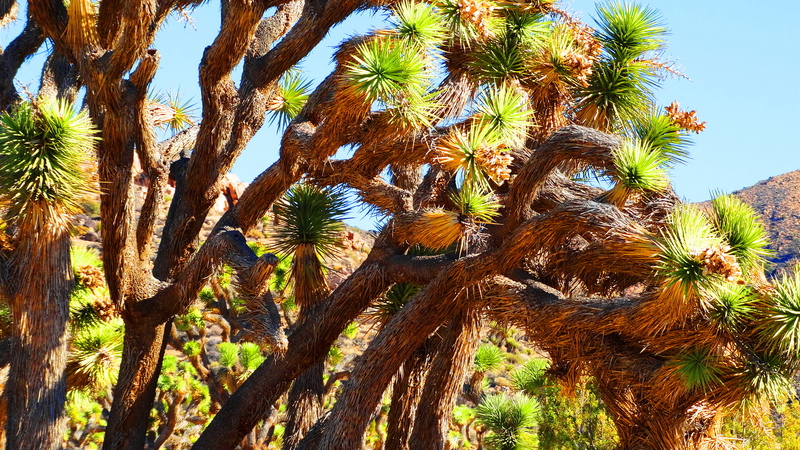 Yes the Joshua Tree has dagger like leaves over eight inches long!! The rocks are formed by geological action in the earth, many millions of years ago! Cindy it is on my reader? These are stunning photos! Wow! Very kind and very appreciated! This posted great! Nice photos. I saw something like this while driving from Tucson to Las Vegas. It was not as striking but did have some trees that looked like yours and the rocks had been worn away like yours also. However, like I said, they caught my eye but were not as striking and beautiful as in the park. Yes they live in four western states, so you may well have seen them! Cheers to you Wally! Congrats on the wedding! Bittersweet time for a mum! Hugz to you!! Right in your own back yard! Wonderful! This must have been nature’s playground. The formation of rocks reminds me of my childhood days and I was quite awful. Just found out. The rocks do look like a youthful giant put them there! But it was created by on own earth millions of years ago! Cheers to you Arjun & hope all is well! In my next two posts you will see much more of them!! So glad you are visiting & cheers to you! Good for you! It is a magical place, with so much to explore, especially when you move off the main road!! We’ll be coming back and back to see each season! Cheers Gary! Wow Great job Cindy.. absolutely awesome photo’s! Thank you for posting..
Special heart-felt thank yous!!! Now I see my post on the reader for the first time!! I am sincerely grateful to you!!! I’ve never seen these beautiful trees before. These rocks are majestic! Shockingly remarkable place! So glad you like it! Oh yes, and bring the rest of the family!! Beautiful, but desolate… especially in summer! That is exactly my experience Curt, you drive through it on the 10 and think ho-hum. Finally, after deciding to drive IN it, the whole scene changes so remarkably. At least I have finally found it! Glad you did too!!! No wonder it is a National Park! Absolutely wonderful pictures! Thank you so much for sharing. Wonderfully kind of you to say so! so glad you stopped by! Great photos of a beautiful scene! I especially like the 2nd to last pic. amazing place isn’t it!! so glad you think so too & cheers to you! I love this place. The spiritual energy of the land is amazing. I was there in March 2012 in the first snow storm in decades. We walked to Skull Rock in a complete blizzard! I found the vegetation of the desert, its resilience, so inspiring. There’s something about the lighting too. I must go back someday. Wow Cindy. What an amazing place and your photos are just wonderful If we ever get to California I’d love to see it. Oh thank you! I hope you do & cheers to you! Wow, beautiful. The desert holds a beauty all its own. Those rock formations are amazing! Yes particularly because they are loose boulders stacked as if by the Hand of God! 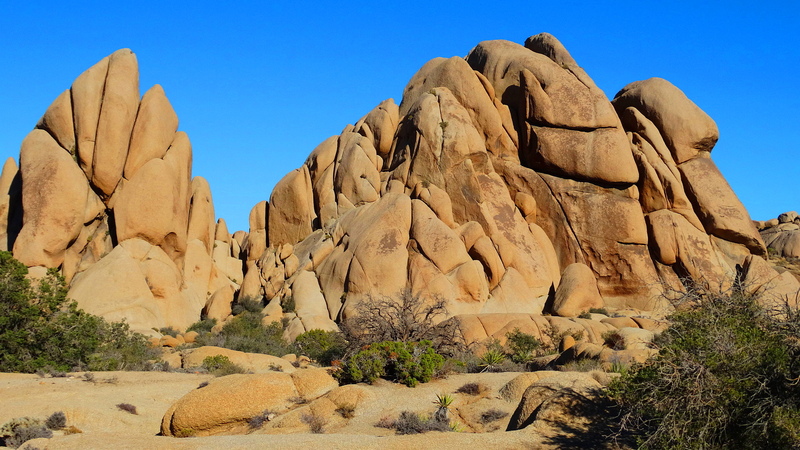 How beautiful — the rock formations and the scenic vistas! Thanks for letting me tag along. You were a joy to have along!! I had to click on a link to get to these lovely photos. They did not appear in the Reader. To add to my earlier comment. Your second post did appear in the Reader. Beautiful photos! Thank you so much for the update and the kind words! Beautiful photos of a majestic and magical place. Your kindness is very appreciated! Thanks for all the great pics!! My pleasure and hope you are doing well!! Thank you, Cindy! I am doing well. The project is finished and a new Art Gown will be posted soon! Hope you are also doing well!